B.S. 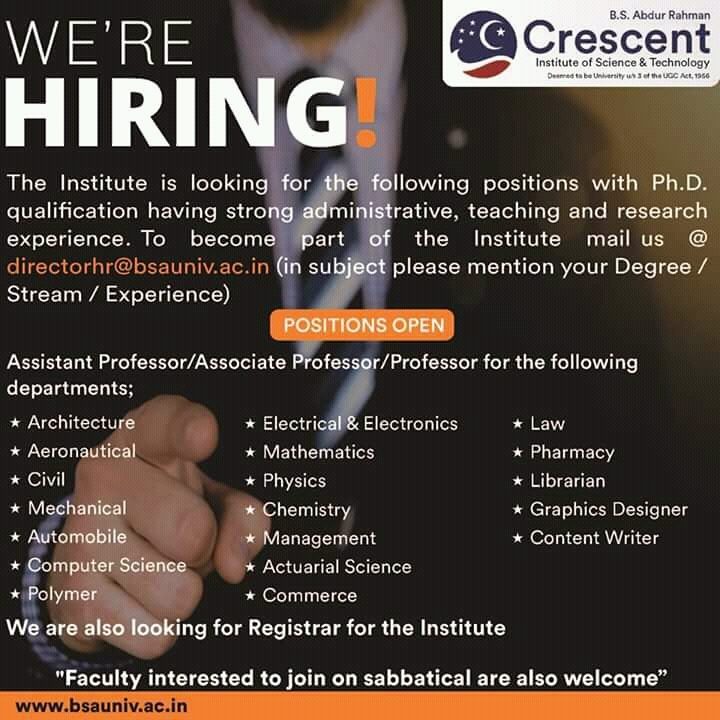 Abdur Rahman Crescent Institute of Science & Technology aspires to be a “Globally Recognized University” through participation in various Accreditation Processes, Rankings and possible Collaboration with premier Institutions, both in India and Aboard. To participate in the renowned “Accreditation Process” like NAAC, NBA, ABET, QS Star Rating etc. and to get awarded “A Grade”. To participate in the premier “National & International Ranking Process” such as India Ranking (NIRF), QS Ranking, THE etc. and to get into Top Ranks. To entertain and encourage the inflow of “Foreign Students and Faculty Members”. To identify a top Ranked University, for “Bench Marking and Collaboration”, through various modes, by every department, of this Institution. To identify and enroll “Affiliate Faculty” from foreign universities and industries.